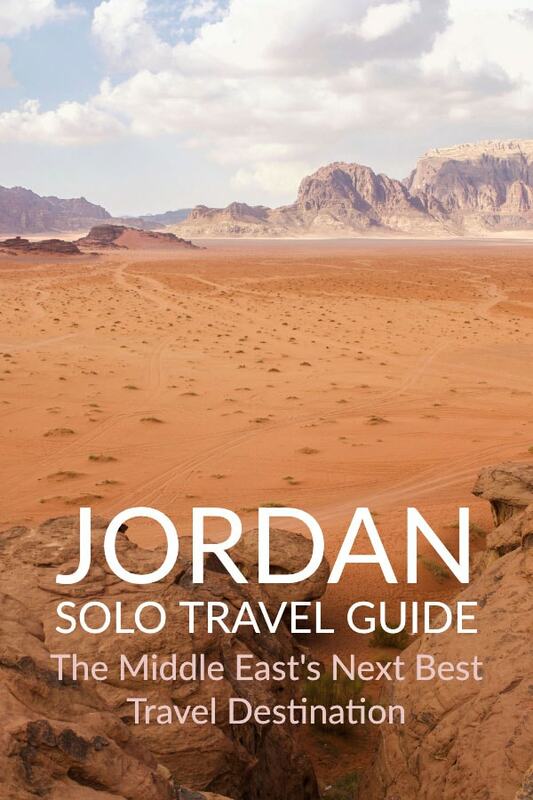 Jordan flies under the “next best travel destination” radar most of the time. The name might be familiar but it’s often heard in the context of Israel or goings on in the middle east. But Jordan is worthy of your attention. This little country in the middle east has a lot to offer in a small space. 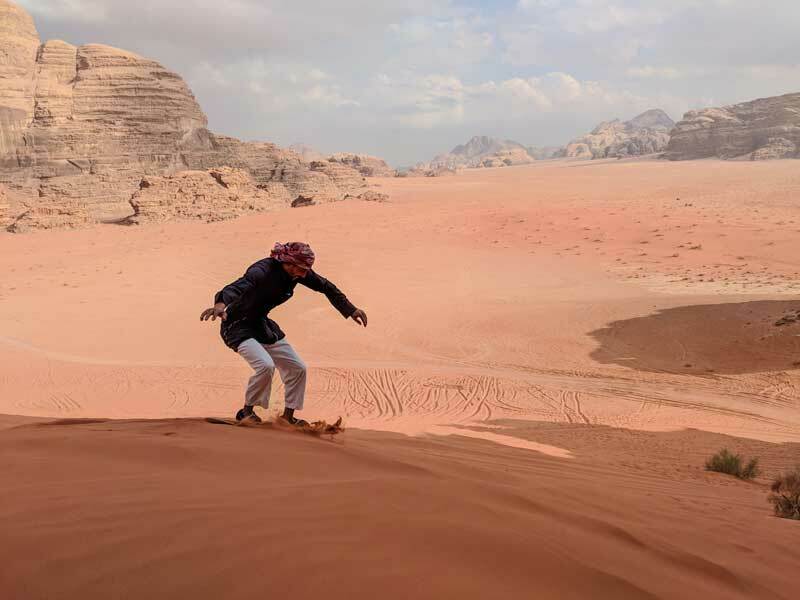 Desert landscapes like Wadi Rum, historical mountains like Nebo and Umm Daraj, ancient cities like Petra, and plenty of opportunities to take part in sports activities like hiking, mountain climbing, and diving make Jordan a compact, yet packed destination for independent travellers. In this post, I'll give you some great tips on the major sites like Petra and Wadi Rum. 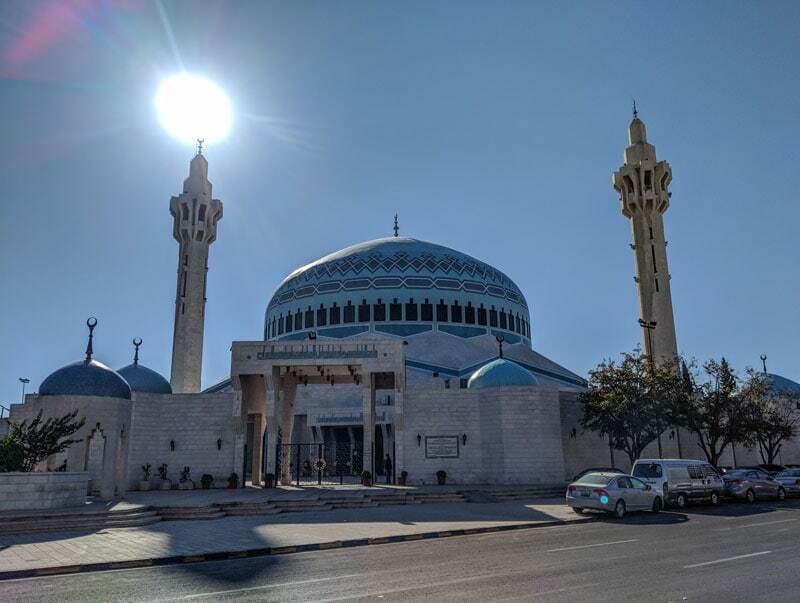 I’ll also discuss a few practicalities like getting around, where to stay in Amman and what to do there, and the kinds of things to watch out for in Jordan. 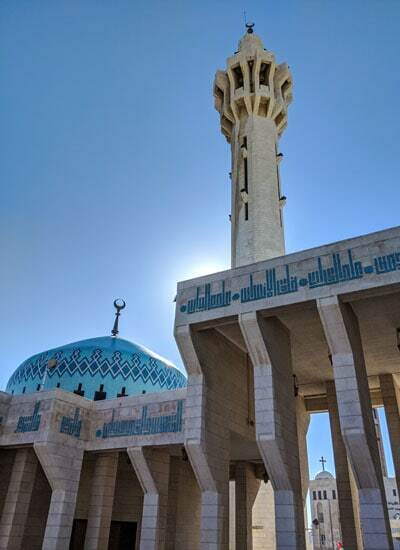 I’ve also included some short anecdotes from my recent trip to Jordan. Check the blue boxes. Enjoy Jordan! 3 Is the Jordan Pass Worth it? The country’s position at a critical point on the Silk Road, its proximity to Syria and Iraq, and the buffer zone between Israel and Arab nations in the Middle East means that Jordan plays an important part in international politics. The Romans ruled here for four centuries and the rich history of the region is visible everywhere. During the last 60 years, Jordan has been a place of relative peace. King Hussein, the revered head of state between 1952 and 1999, acted as a peace broker in the region. Despite the political stability, incredible history and natural beauty, Jordan is still finding its feet in the travel & tourism sector. News of the region on international television and internet channels affects tourist numbers. Many people lump Jordan in with the war zones, refugee camps, and dictatorships of neighbouring countries. Thanks to the reports of conflicts in that part of the world, tourists to the region are a little more adventurous. 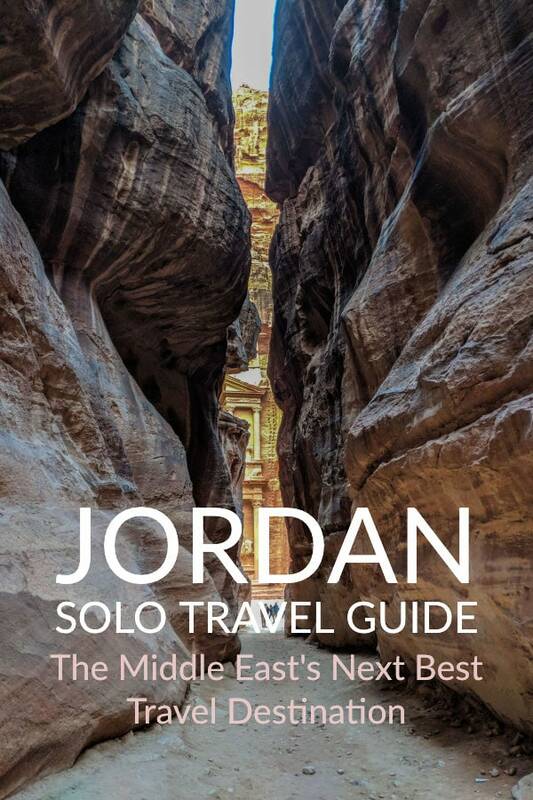 If you’re looking for a less touristy Egypt, Jordan is the next best thing. 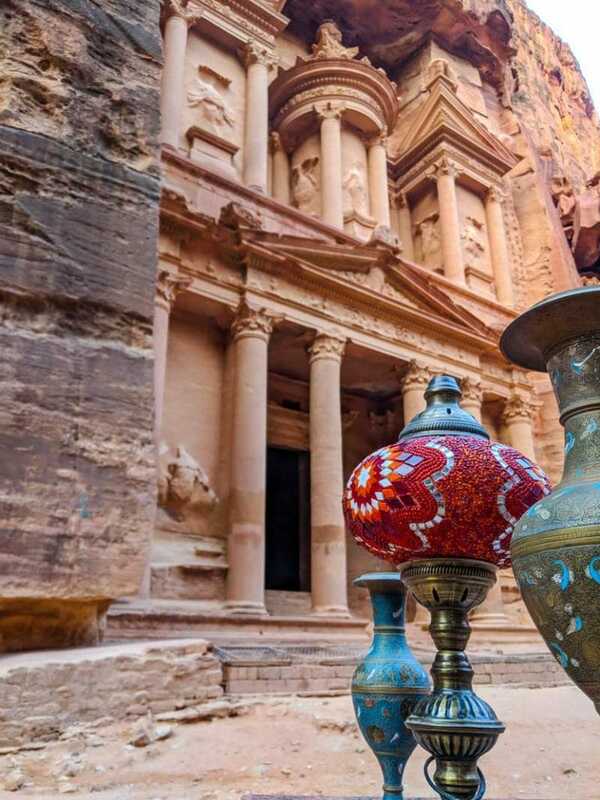 Combining beautiful landscapes with the history and physical reminders of thousands of years of settlement, Jordan is a small country with a lot to offer. And in case you didn’t know, scenes from the movies Lawrence of Arabia and Indiana Jones and the Temple of Doom filmed here. 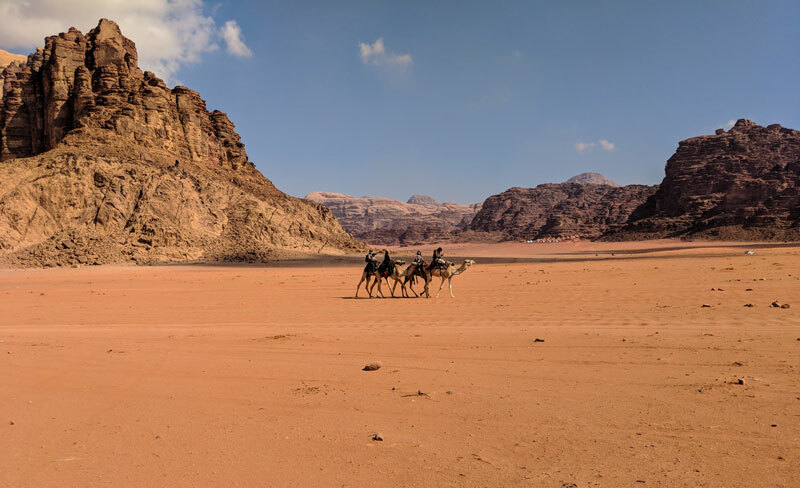 In “Lawrence”, David Lean's epic movie, Wadi Rum stood in for, well, Wadi Rum in 1916. Watch the movie to get an idea of just how beautiful and barren this part of the world can be. The Temple of Doom contains a scene in which Indiana Jones enters the Treasury in Petra. I'd guess that this single scene alone sparked a huge increase in interest in not only Petra, but Jordan and the Middle Eastern region. 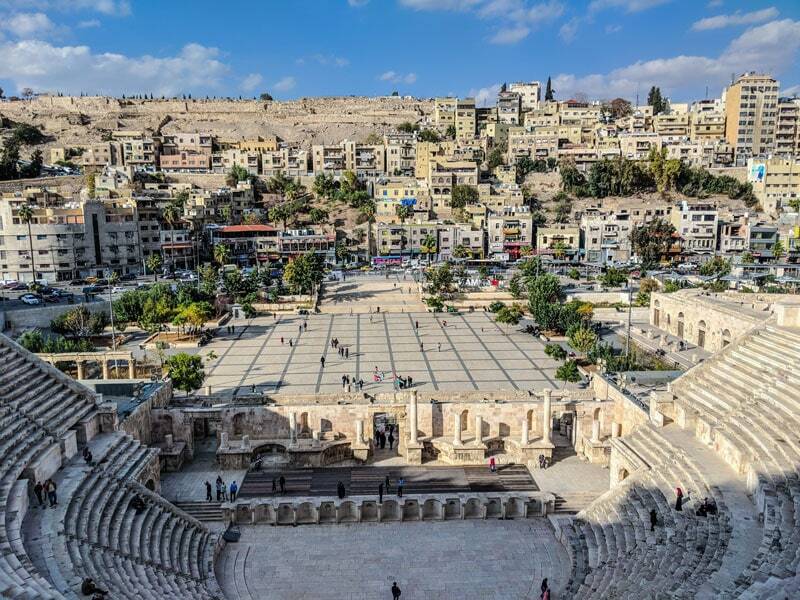 But that’s not all, Jordan has one side of the Dead Sea, the Jordan River, the spectacular Roman ruins of Jerash, the tourist resort of Aqaba, and the buzzing capital of Amman. For the coolest temperatures and fewest tourists, visit during the winter months of December, January, and February. This is also the rainiest time of year. The further north you go, the cooler the weather in winter. Aqaba can bathe in 20 degrees C while Amman freezes in the winter months. July and August (visitor low season) see fewer tourists but the hottest average temperatures. You'll also get the longest days and the most guaranteed hours of sunshine. Divers should head to the southern coast between September and November. A definitive yes. 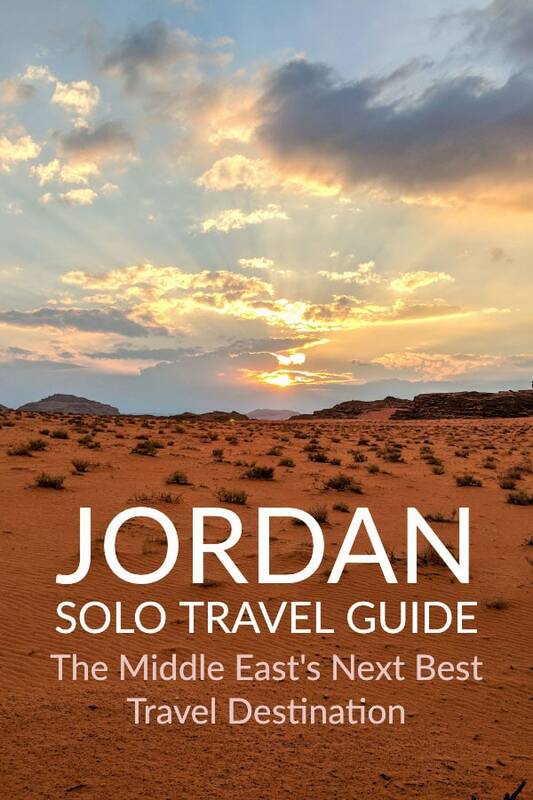 If you plan to spend more than one day in Jordan, the pass will save you plenty of money. 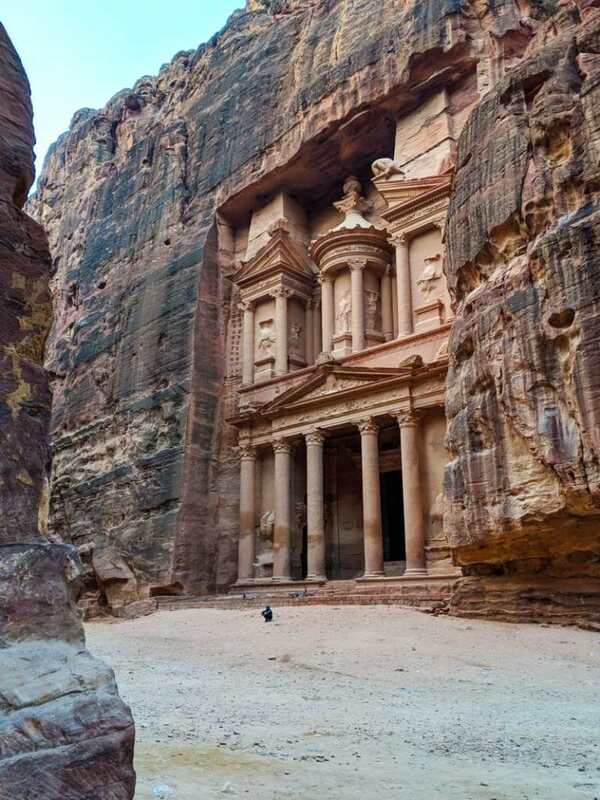 The Petra entrance fee alone will cost you almost as much as the Jordan Pass. And holders of the Jordan Pass have their tourist visa waived at immigration (as long as you stay for at least three nights in the country). There are three categories of pass: Wanderer, Explorer, and Expert. 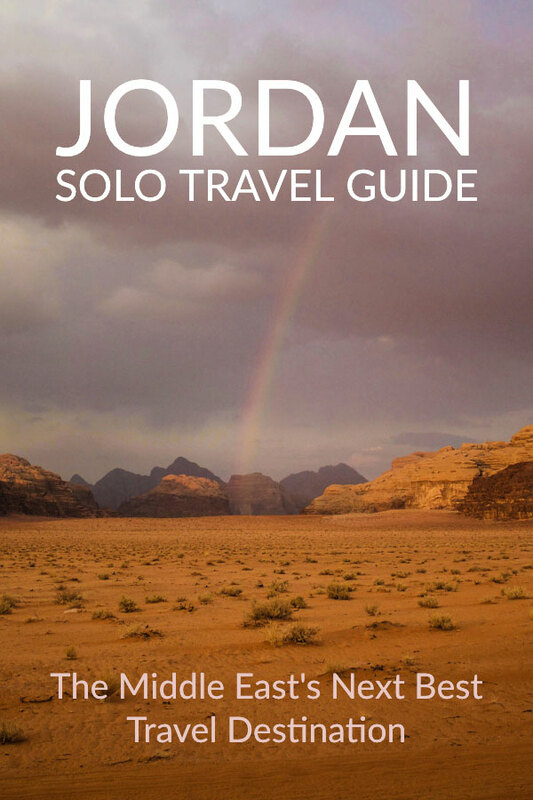 I opted for the Jordan Explorer, which gives you 2 days in Petra. 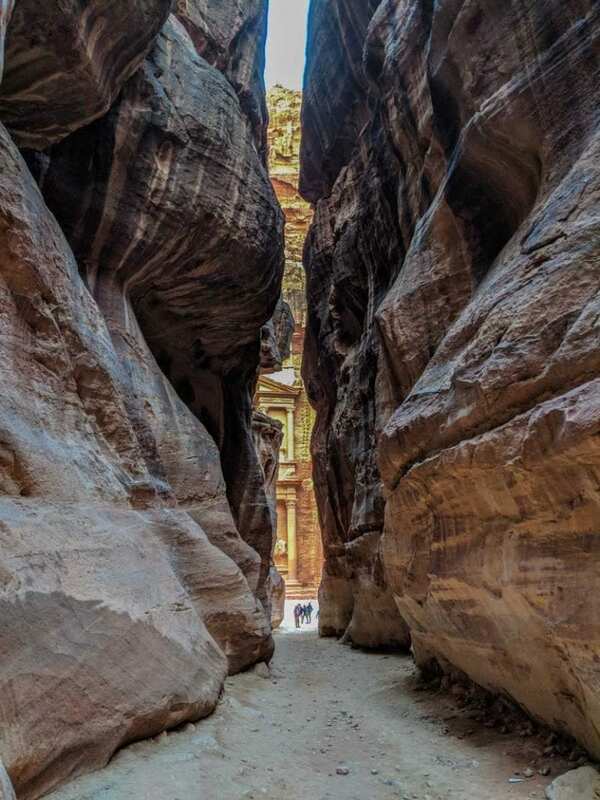 The number of days in Petra is what determines the pass you take. The Jordan Pass is great value. If you're staying for longer than a day, it's a must-have. Entrance to Jerash, Wadi Rum, the Amman Citadel, Umm Quays, the Roman Theatres in Amman, the Lowest Place on Earth museum and many more. The Jordan Pass will save you money and time. Just show your pass at the entrance to any site (most of them) that accepts the pass and walk straight through. Keep a digital copy on your phone and show it to the officials. Note: the pass expires two weeks after first use. If you’re based in Europe (or you make a continental connection), you’re in luck. As of late 2018, Ryanair is running flights to the Red Sea port town of Aqaba from major European cities. It’s a cheap way to get to a country not considered a budget destination. There are direct flights from the following cities to Aqaba: Athens, Cologne, Rome Ciampino, Sofia. These flights are great value (I grabbed a €9 flight from Rome to Aqaba and a €15 from Amman to Budapest). The taxis to the airports were more expensive in both cases. 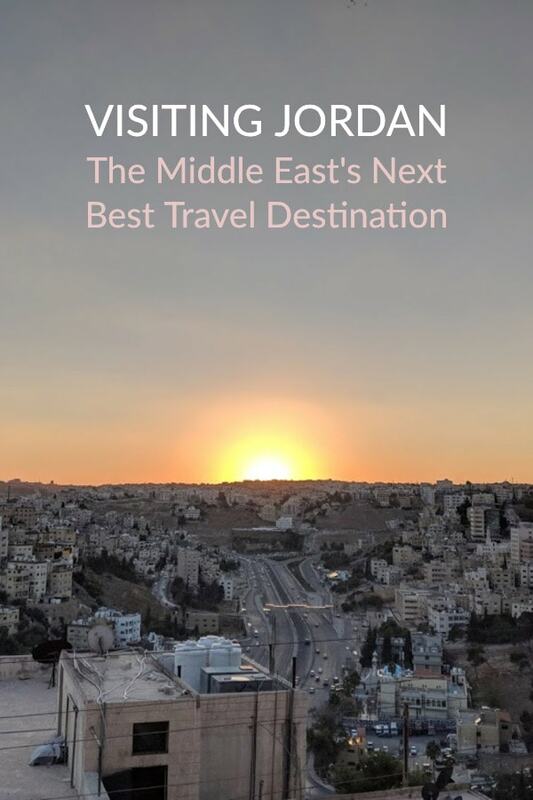 Try eightydays.me for some travel connection ideas to Jordan from almost anywhere in Europe. Queen Alia International Airport, a modern, recently refurbished building, lies 40km south of Amman. The best way to get to the capital is by taxi. The other airport is King Hussein International Airport, north of Aqaba. A small airport but efficient and within easy reach of Aqaba city. Driving over from Israel is possible but it can sometimes be a circuitous trip. The geography of the mountains, the sea, and border crossings means you can only cross over at certain points. There are three border crossings only. Getting from Jerusalem to Petra, for example, is a 450km journey through the far north or far south of the country. Flying might be the best option. There’s a 10 JOD fee to pay at land border crossings when entering or leaving the country. You can also arrive in Jordan by Sea. Many travellers visit Jordan after visiting Egypt by taking the short trip from Taba to Aqaba. At $90 USD for a return trip, it’s not quite backpacker-friendly, but the alternative is to travel through Israel, which will work out similar in price once you spend time at borders and pay for travel. Israeli stamps on your passport might also cause you problems if you travelling to other Arab states (Egypt and Jordan exempted) so be careful with this route. The only disadvantage is with taxi transport to and from major sites. If you take cabs alone you might find you spend more than you budgeted for. Ask your hotel or hostel manager or front desk if they know of other tourists that might share a cab. The roads are of a high standard and the driving isn't too bad. However, Jordan's tourism infrastructure is still lacking. Plan your travels and avoid wasting time. Jordan websites are stuck in 1997 so don’t expect to get much more than cursory information from them. And don't expect online booking systems. Wherever possible book through a provider you already know and trust. Taxis are the main transport option for tourists. Unfortunately for budget travellers, taxis in the country are not cheap. And drivers almost always smoke cigarettes. One after the other. It’s not a great travel experience. The bus from Petra to Amman drops you in the southern part of the city. 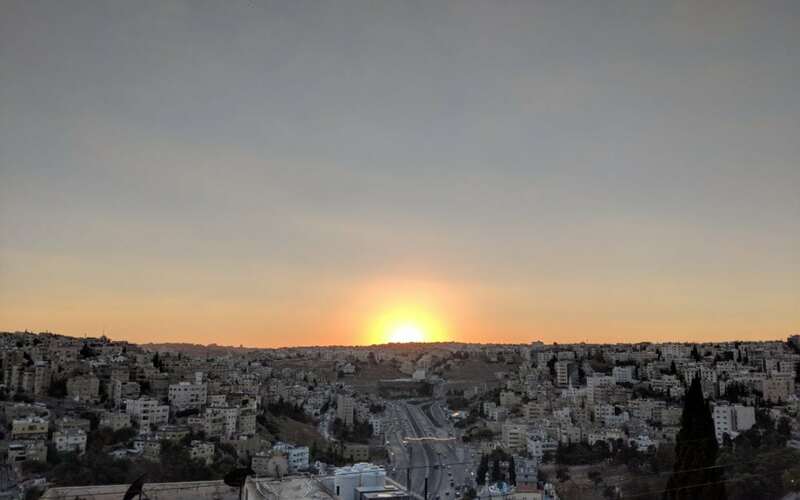 You must get another taxi from there (or navigate a long bus journey and connection) to get to the centre of Amman. It should cost around $5 but if you get quoted higher, shop around. Ask the bus driver before you get off for the actual price. If you plan on taking buses in the cities give yourself lots of time and expect to do a lot of chatting with locals (a good thing, in my book). If you’re pressed for time, I'd suggest avoiding bus travel. Renting a car is a good option. The driving here isn’t half as bad as in places like Egypt, Saudi Arabia, or Iran. Self-driving wins as the most practical way to get around Jordan. Driving allows you to jump off at stops that only tour buses visit. You can spend as long as you like (or as short as you like) at the dead sea. Getting from Aqaba to Petra or Petra to Amman is twice as fast with your own car. Cycling is also possible and is a great way to get around the country between major towns. The Cycling Jordan Facebook page is a good place to start if you’re looking for more info. Keep in mind that biking around the cities will reduce your chances of living to a ripe old age. There aren’t any (regular) trains in Jordan, which is a pity as it’s a beautiful country for a long train ride. Flying between Amman and Aqaba is quick (30 minutes) and cheap (less than 100 USD) and is a viable option for avoiding backtracking. You could also add Jerash in here but it’s not as well known as the other three. If you’re short on time visit these three. If you can only choose two, skip the Dead Sea. 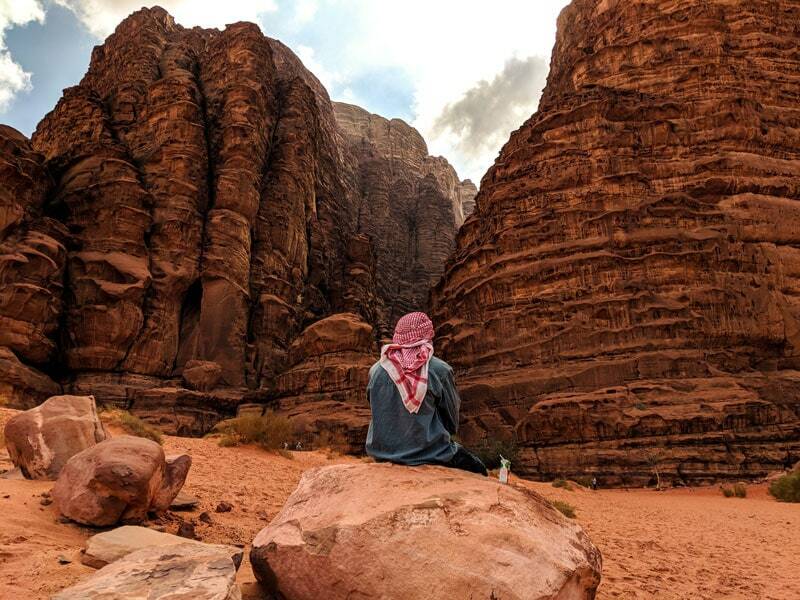 Jordan is not a backpacker destination, by any means. Even for Europeans, the Jordanian Dinar is strong (on a par with the British pound) and costs are similar, if not more expensive than in Europe. Turkish coffee will cost you anything from €0.50 ($0.60) to €1.50. But Turkish Coffee is an acquired taste. A regular coffee (Americano, Cappuccino, or Espresso from a machine) will set you back anything from €2 to €5. And the coffee is poor quality. Public transport is cheap but runs at its own schedule. Tour buses and private buses are the most common transport most visitors around the country. Independent travellers are not the target demographic. Taxis are the most convenient way to travel but you can expect to pay accordingly. Lunch of kebabs and a soft drink costs $7-8 in Petra and Aqaba. The capital has more choice and cheaper prices for foods as long as you stay away from the touristy areas when eating. Accommodation options are cheap and shabby at the low end and upmarket and very pricey at the high end. Jordan because its perceived as a safe destination in this region. As a result, it attracts wealthy visitors. I’d like to point out that I’m not a fan of Jordanian food. Vegans and vegetarians are well catered for but vegetables are often limited to tomatoes, eggplant, and salads. There’s no pork, obviously, and beef is poor quality. Lamb in Jordan on the other hand, is pretty darn good. This is the red meat of choice and it’s been staple meat in this region since, well, people arrived here. There are some superb dishes in Jordan, despite my reservations. The meat, when prepared well, is tender and delicious. The vegetables, when there's variety, taste great. And delicious spices and sauces turn rice dishes into something to write home about. You will feel at home if humus, falafel, yoghurt, tahini, garlic, bread, olives, and rice ring your bell. Jordanian food borrows from its neighbours. In effect, the entire region has developed it’s cuisine together. The shifting geographical borders of the lands and zones here means that what is now Jordan was part of larger kingdoms, states, and colonies at various stages of the region’s history. You’ll no doubt find Mansaf on the menus in Jordanian restaurants and I’d encourage you to try it, if not only for the cultural experience. It’s the Jordanian meal and consists of lamb, Jameed (see below), rice, nuts, and delicious spices like cumin, saffron, and cardamoms. 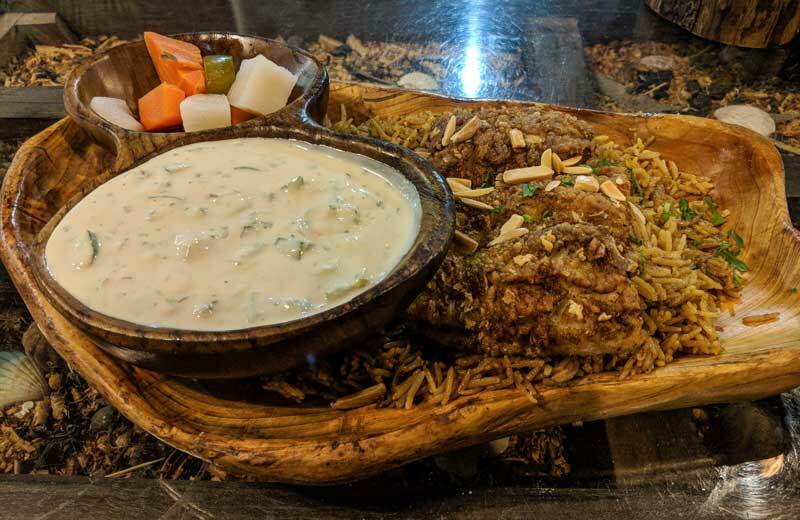 Mansaf, traditionally served on a big platter for everyone to pick from, is a must do dish, if only for the social tradition. Jameed is a goat yoghurt and is an essential part of Mansaf. I love it. If you’re not used to goat’s milk it can be musty or salty (it’s hard to describe the smell and flavour) but it’s worth persevering. In a Mansaf, any hint of goat-iness is hard to discern. Jordanian shawarma is everywhere. Similar to the Kebab, typically associated with Turkey, and Gyros from Greece, the shawarma from this part of the world is generally made from lamb or chicken. The sauce is almost always tahini and the meats marinated. Street-side takeaways are the best places to buy Shawarma. Breakfast in Jordan might leave the carbo-loading cereal fans feeling empty. Olives, cucumber, yoghurt and some pita bread is the typical first meal of the day here. But it’s delicious (and much more nutritious than a continental or cereal-based breakfast), so there’s no reason not to try it. 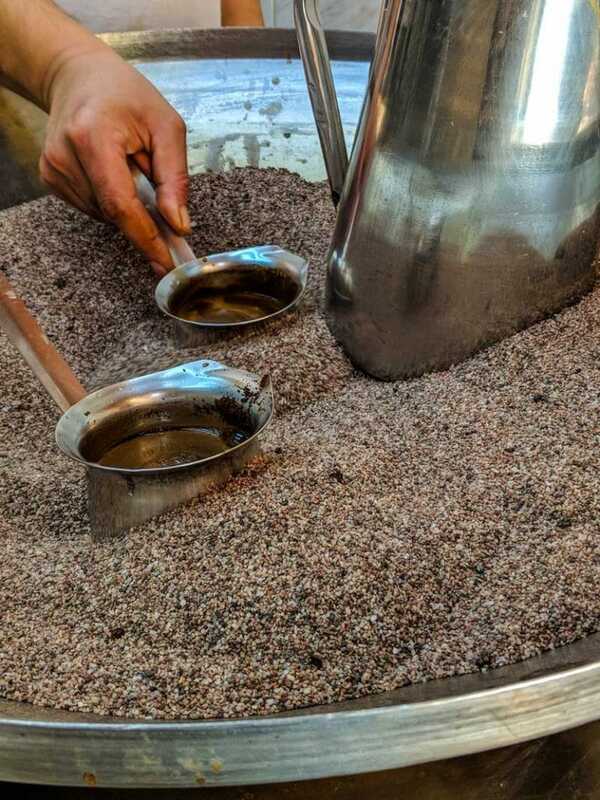 Jordanian coffee (cheap at less than USD 0.50 is generally the Turkish type. Gritty and bitter, made more drinkable by the addition of tons of sugar. Without sugar, I can drink the first few sips. But when it gets close to the gritty sediment, I can’t give up. I wonder what havoc the coffee grinds cause to the stomachs of the locals. The high-end hotels keep to a good standard. 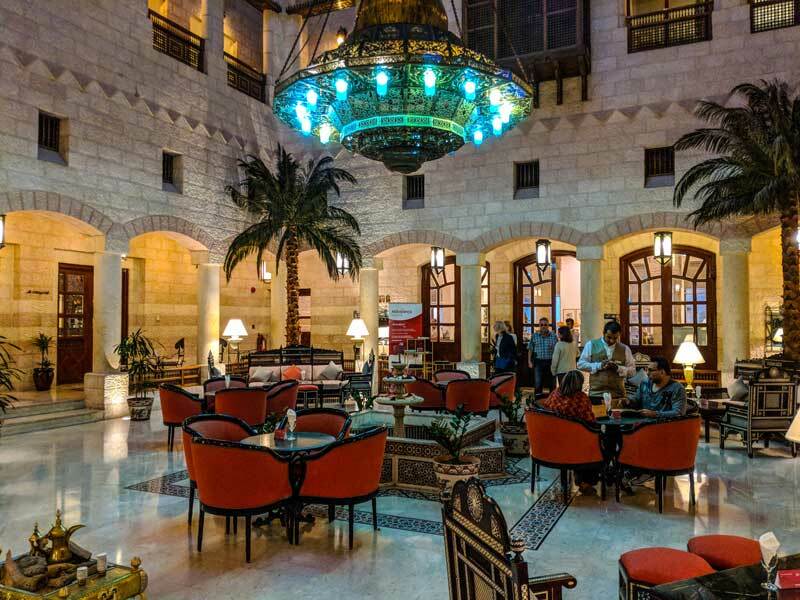 5-star hotels are plentiful in Petra, the Dead Sea, and Amman. Lower end hotels can be rough around the edges. For the same price as a hotel room in cities like Rome, Berlin, or Istanbul, the quality is lower. Hostels pop up around major towns and tourist areas and prices are comparable to other tourist destinations. I’m a fan of Agoda. I don't use Airbnb these days. The value is long gone. I searched for rentals on Airbnb for all of my overnight destinations in Jordan but the prices were high and the quality was low in all cases. The Jordan Tower hotel is immensely popular with solo travellers and backpackers. It has single and double rooms and there’s an excellent lobby and area to hang out. The hotel sits in the heart of the old town and right beside some main attractions. The Zaina Plaza hotel is cheap and cheerful. Nothing too fancy here but the rooms are clean and quiet and the location is great. I spent a couple of nights here. If you don’t mind being a little further out or if you have transport, the Al-Qimah Modern Apartments Studio in West Jordan is a good option. I stayed at the Bedouin Lifestyle Camp, which by all means, is similar to the other camps. There are few differences between the aesthetics of the camps dotted around the Wadi. This is a basic place but it’s fine for solo travellers as it forces you to get out and meet people. The Lacosta hotel isn’t a budget option but it’s great value. Prices run from around $80 USD a night. The hotel’s location is one of the best in the town and the rooms are clean and inviting. There’s a nice breakfast too. If you want to splash out a little (or if your budget goes further) the Kempinski Hotel is gorgeous and an excellent choice for a night in Aqaba. I love the Kempinski hotel chains and if I get the chance, I’ll spend a night in one. Expect to pay a couple of hundred dollars a night but I’ve seen deals as low as $120 for this hotel. Check in advance and avail of Agoda’s special offers and discounts. Jordan is safe. There hasn’t been a war since 1973. Israel and Jordan signed a peace accord and the Jordanian government often acts as a ‘neutral' intermediary in conflicts in the region. According to NationMaster, official crime levels in Jordan are almost 50% less than in the United States. Watch out for scammers (there are plenty) and anyone that out of their way to help you. 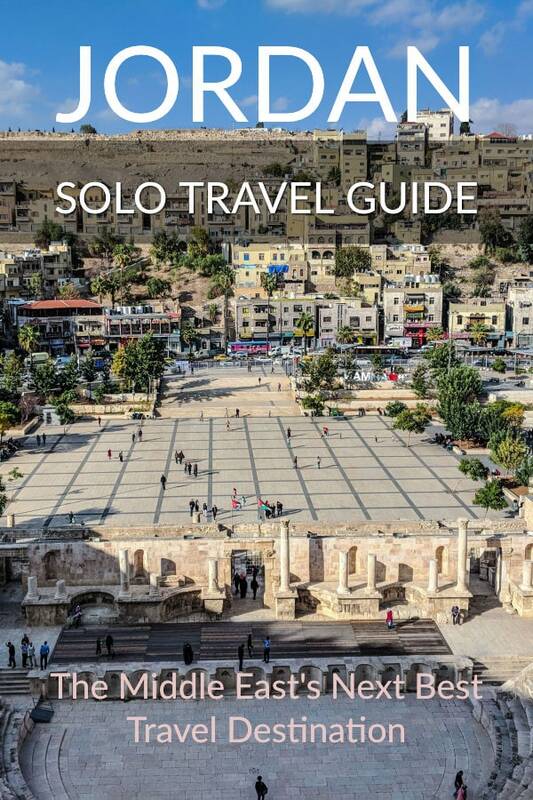 Solo female travellers in Jordan should prepare for travel in Jordan as they would in any Muslim country. Dress according to local sensibilities. Wandering around in skimpy clothing probably won’t get you into any tricky situations, but you’d be showing a complete lack of respect for local tradition and customs. Don’t expect to enter mosques or any important sites if you don’t have the proper attire. And this goes for men too. Shorts and singlets not only send the wrong signals and show a lack of respect, the authorities ban them from many sites. The UK Foreign travel advice sends a few warnings about isolated terror attacks in malls around the country on the official website but with almost 100,000 British people visiting every year and next to zero incidents, we can assume it’s a safe place. Don’t cross the border into Syria or Iraq. In fact, straying close to the borders, especially the Syrian border, could land you in trouble. Although the locals welcome foreigners with courtesy, don't accept lifts from strangers. Vast, Mars-like, beautiful Wadi Rum is one of the most captivating places I’ve been to in over 25 years of travel. Forget the Lawrence of Arabia association for a while (although I have to admit, that was a big part of my interest in visiting) and enjoy the silence, the tough beauty, and the calm. The Bedouin here live off tourism but still preserve many of their traditional ways. Most tours are for 4-8 people and there’s often space for one more. Solo travellers won't be left out. The independent and lone travellers I met weren’t disadvantaged (although most visitors travelled as couples). 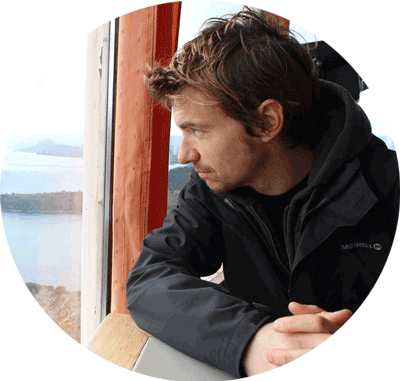 Accommodation options for solo people are plenty. Many of the places to stay at the low-mid price range are no cheaper for couples. Wadi Rum (Rum Valley) is a desert valley in the mountains to the south of Jordan, near Aqaba and the Saudi Arabia border. It’s a barren, red dessert that reminds me of photos of Mars. You can spot wildlife such as geckos, eagles, and camels and when it rains, hibernating desert plants spring out of the sand. It’s a quiet and empty place. And that’s part of the charm. 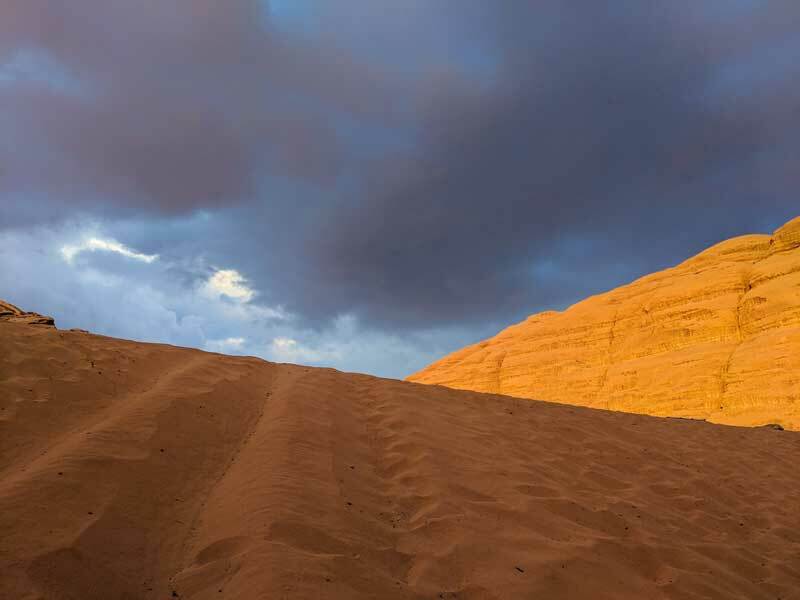 The Jordanian government has done a good job of keeping the national park as untouched as possible. There are no hotels and westernised shopping malls inside the national park. Traditional Bedouin camps and tourist camps are the only man-made features. All are low-key and located in inconspicuous spots around the valley. Wadi Rum area lacks any kind of infrastructure. You won’t see any true roads apart from the one heading to the village from the highway. Four-wheel drive vehicles buzz around the landscape and leave tracks in the sand. But the tracks are temporary and do little damage to the environment. How much does it cost to enter Wadi Rum? You can’t enter the valley (past the Bedouin village) in your own (or rented) vehicle. So if you plan on going it alone in Wadi Rum, you’ll be on foot from that point. At the risk of sounding obvious, this is the desert and it can be hazardous to your health. Be prepared. 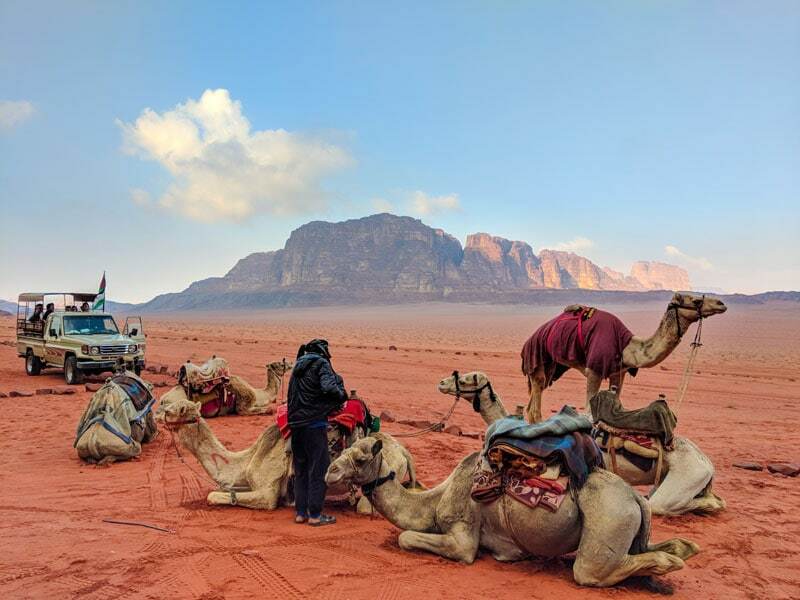 Most of the travellers I met had pre-booked their entire stay and activities in Wadi Rum. I’d advise you to do the same as it makes things easier to manage and it can work out cheaper. You can book accommodation in advance and just turn up but you’ll find it harder to bargain and find the right activity deal for you. You might also find that everything is booked. There are limited spaces across all of the camp and tour providers so avoid disappointment and check it out in advance. Everyone else is doing it. Everyone should camp overnight in the desert wadi. It’s a fantastic experience and inexpensive. The camping grounds are scattered around the valley but are inconspicuous and low profile. 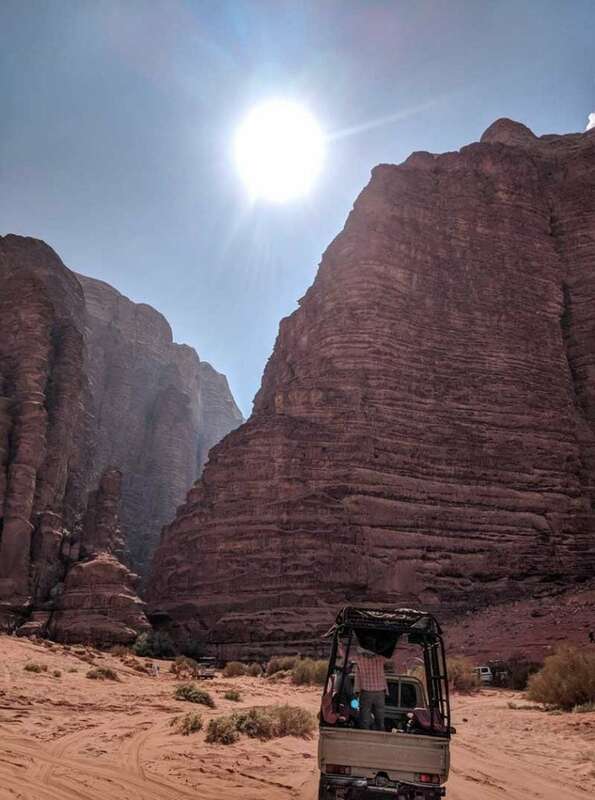 A word of warning: unscrupulous tour operators that don’t have a licence to lead groups in Wadi Rum often trick visitors into camping outside of the UNESCO World Heritage area. I haven’t seen these areas, and by all accounts, they are beautiful places to stay. 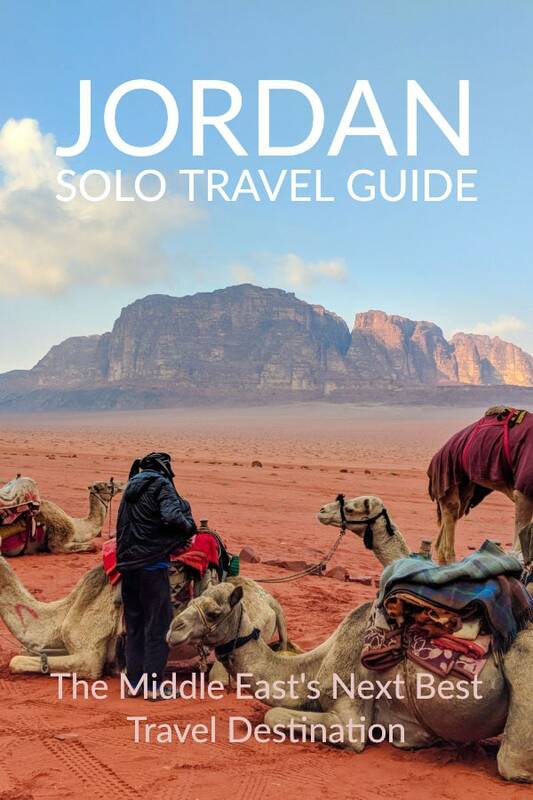 But if you’re here to visit the real Wadi Rum, make sure you stay with a reputable guide. The GPS on your phone will also show you if you’ve strayed too far off track. Most of the camps will provide food in the form of a traditional underground bbq, called a zarb. That’s the food that goes underground, not you. 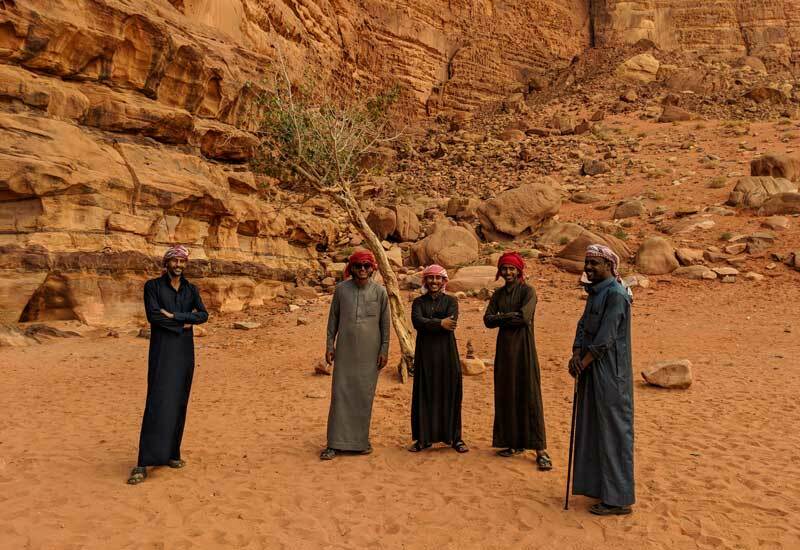 Your evening's entertainment will be traditional Bedouin songs, played by musicians who also double as cooks, guides, and most likely, your driver for the Wadi Rum tours. The tents range from square framed shacks with material stitched onto the outside to luxury tents good enough for the likes of Elon Musk. My accommodation was a little more modest. A tiny square box with a hole in the wall (a window that wouldn’t shut) and a thin mattress gave the place the air of a prison cell with free entry and exit. But who was complaining? At night in the desert here is little light pollution and you’ll have almost uninterrupted views of the night sky and the stars. This part of the world has been inhabited for almost half a million years. The only thing that has changed is the people. The scenery and stars look similar to how they did when the first inhabitants arrived. If you’ve seen the movie The Martian, with Matt Damon, you’ll recognise the scenery here. How about Rogue One (Star Wars) or Prometheus? Yep, this place is Hollywood’s “go to” spot for Mars or other world scenery shoots. In the movie Lawrence of Arabia, the legendary T.E. Lawrence fought with the Arabs and the Bedouin against Turkish rule back in 1917. The movie of Lawrence's life was partly filmed her and Wadi Rum stands in for, well, Wadi Rum. Lawrence Spring sounds like a delicious oasis with crystalline cold water. Don't get too excited. The spring resembles a puddle of water etched into the side of a mountain. To get to this slightly underwhelming landmark, you have to scramble up about 500 metres of rock. I loved the climb up. It was great to stretch the legs after a lot of driving. If you’re not fit or you’ve got hip problems, skip this part. But it's a great spot to look out over the places T.E. would have looked at every day. It wouldn't have looked much different. I recommend you do a full-day tour by 4WD. Using camels as transport might sound more romantic but it takes a lot more time to cover ground. There’s a lot to see and do here and you probably don't want saddle soreness and rash to hamper the rest of your visit. My initial thoughts about spending 5 or more hours in the back of a 4WD taking photos out the side weren't happy ones. I decided to look for an alternative. I soon found out that there aren’t any. So with some reluctance, I signed up for the long tour. Happily, that turned out to be the better choice. The entire tour took almost 7 hours and it wasn’t just an opportunity to take photos. We got to hike up to Lawrence spring, take sandboards out on the sand dunes (like snowboarding but in the desert), climb up mini-mountains to gaze at beautiful vistas, visit beautiful rock formations such as the Umm Fruth Rock Bridge, walk through the Petra-like valley formation called Jebel Khaz'ali, drink tea with the Bedouin, and tick off a few locations made famous by that guy Lawrence again. After a day in the back of a 4-wheel drive, running up sand dunes, and climbing the sides of valleys, the thin-mattressed bench in my airy shack was calling. As basic as it was, I quickly fell asleep. After what seemed like 10 seconds, I woke to the sound of hammering on my door and a constant white noise outside the shack. Rain. Someone had come to deliver a wake up call. It was pouring and a 2 to 3-inch sheet of water ran between shacks by this stage. I did what any sensible person would do and went back to sleep. With my earplugs in. After another 10 seconds, someone else called by to find out if I’d drowned or not. They must have done a head count and noticed someone was missing. It was one of the Italians I had befriended and in Italian-Spanish-English, they made it clear that I had to get moving, right then. By this stage, the water had turned into a mini torrent. I trudged up to the large tent at higher ground and found that I had nowhere to sleep. The other campers had taken all the mattresses and spaces on the floor. Fair enough. I had nobody to blame for that one. The Italians took pity on me again and shifted their things around to offer me some space. Grazie. From experience, sleeping in large tents with full-bellied, weary travellers in an enclosed space is like trying to sleep at a chainsaw convention. I plugged my ears, moved the half-eaten chicken leg from dinner out of the way of my face on the floor and tried to sleep. And to my surprise, I did. What else can you do in Wadi Rum? Hot Air Ballooning is a thing too. I can’t vouch for the safety or quality but searches on Google for “hot air balloon accident Wadi Rum” return nothing. I assume that it’s safe. The Wadi Rum Bedouin camp runs hot air balloon trips of 1 hour starting early in the morning. Rum Stars (love the name) also does trips. The cost is 150 JOD, which isn’t cheap by any means, but I guess they burn a lot of fuel getting that balloon airborne. Fuel in the form of gas/petrol isn’t cheap in Jordan, despite (or maybe because of) its oil-rich neighbours. It’s a desert so expect a hot and dry atmosphere for most of the year. The summer is blisteringly hot but humidity is low. In the winter it can get very cold. I visited in November and it was freezing at night. Thermals, hats and gloves outside at night are essential. Unless you’re from Norway or something. Wadi rum in December and January is colder again and less frequented by tourists. Don’t expect to use the hotel pool during this time though. The maximum average temperature in July and August is 35C and this drops to 14C in December and January. There’s a regular sloping scale between these two times. Summer (June to August) : Hot, dry and sunny. Best for early morning and late evening sightseeing. Autumn/Fall (September to November): More bearable daytime temperatures. Easier to see the (later) sunrise and (earlier) sunset. Peak hiking and trekking season. More crowds. Winter (December to February): expect rain, nicer daytime temperatures, cold evenings and nights, some cloud cover. From Wadi Rum to the dead sea your best bet is to rent a car (in Aqaba or Amman) or take a taxi from the Wadi Rum village. Call for the taxi in advance as they don’t hang around for long. There are millions of potential routes here with some well known climbs marked out and maintained. The Crag website for climbers lists over 60 known routes. Winter is climbing season as the 40C summer temperatures make things a little uncomfortable. This is one of the best places in the middle east to trek. 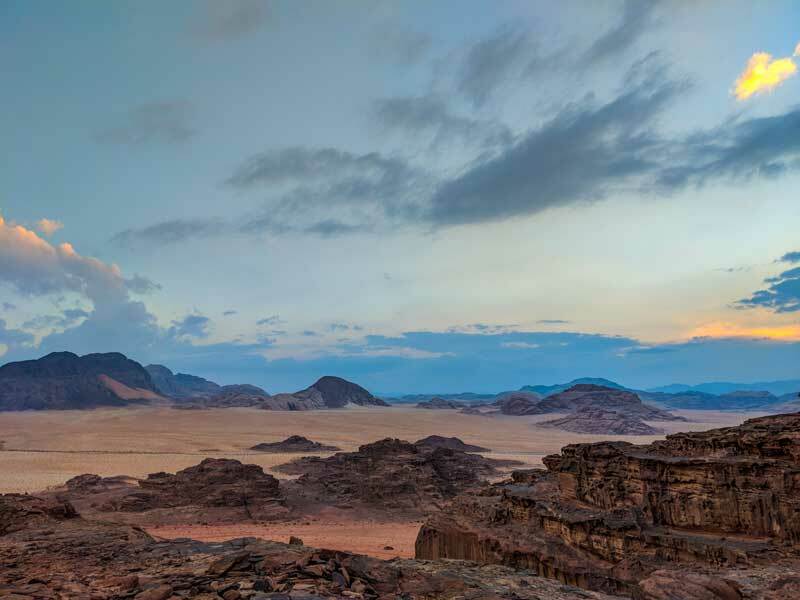 The Jordan Tourist Board promotes the activity and encouraging trekkers, hikers, and walkers to visit Jordan by supporting organisations that develop mark hiking trails throughout the country. Hiking tours are popular but you can walk any of the routes alone. The Jordan Trail is a popular trail promoted by tourist boards. The Jordan Trail is long distance trail running the length of the country. It’s a 40-day hike so not for the casual walker but with some training and a steady pace, any fit hiker should be able to tackle it. 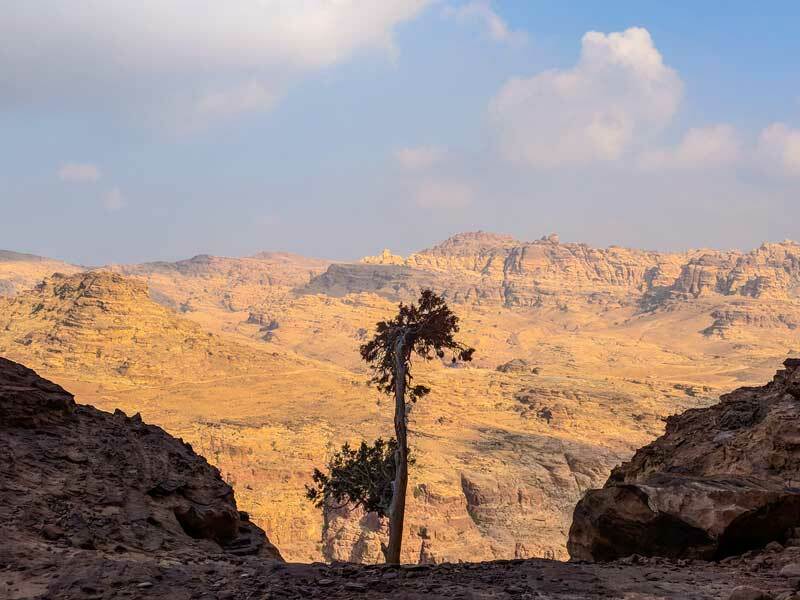 Passing from forests in the north to wadis and mountain villages like Petra and finally to Aqaba on the Red Sea, the Jordan Trail is a great addition to any hiker’s bucket list. I don’t maintain a bucket list but this trail is on my mental list of things I’d like to do. 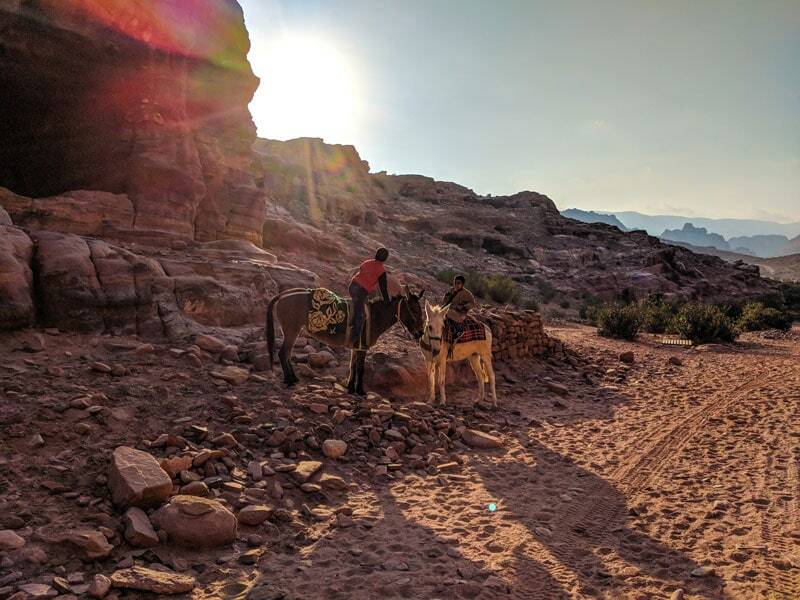 One interesting aspect of the trails in Jordan is that many of them have been used for thousands of years. Walking the length of the country was something travellers had to do as part of their migrations, family duties, work, and trading. 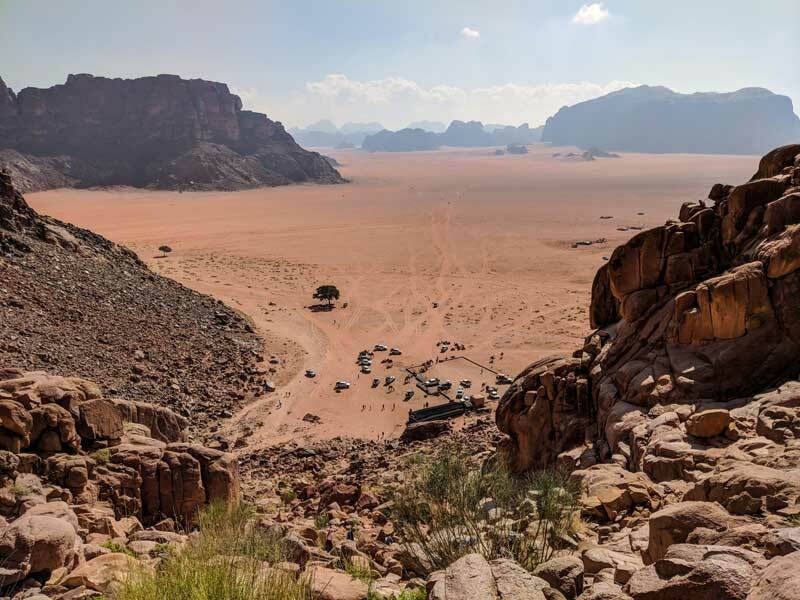 In 2019 (March to April) an annual event called the Jordan Thru-Hike takes in 684km of challenging trails. It costs 3000 JOD, which is around 4200 USD or 3700 EUR. The price includes food, water, accommodation, and a local guide. • UNESCO World Heritage Site – The World Heritage Site title means that Petra is protected internationally as a culturally important landmark. • One of the most famous and important archeological sites in the world. And you can wander around it, sometimes alone, like an adventurer. 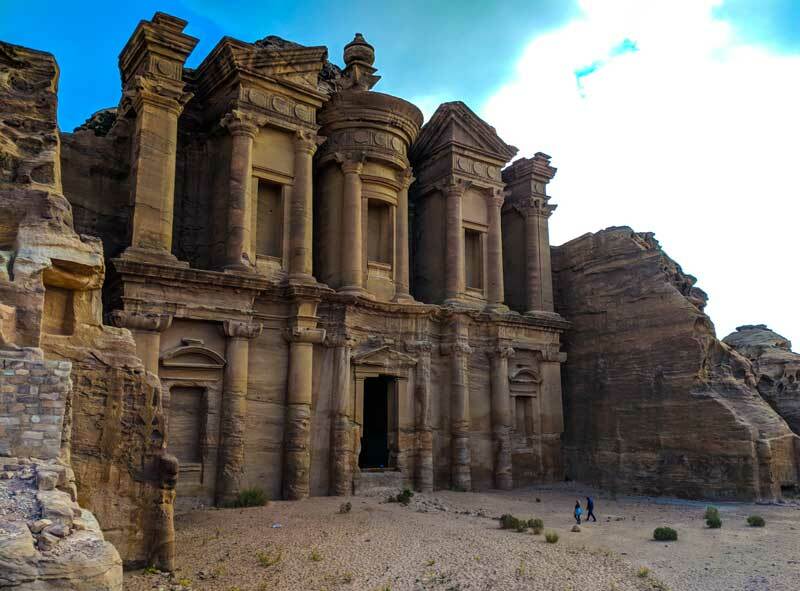 • One of the New Seven Wonders of the World – Decided by popular vote on the internet, the new7wonders.com website declared Petra one of the winners. UNESCO does not support the work of this website. • History fans/buffs/enthusiasts (like me) enjoy the Nabatean, Greek, Byzantine, and Roman architectural features. Scientists are using satellite imagery to find even more parts of the city and by some estimates, less than 1/5th of the site has been excavated. The history of the place is fascinating and even the modern history reads like a modern Indiana Jones (more on him below). A Swiss traveller called Johann Ludwig Burckhardt went looking for the main town of the ancient country of Nabataei. He knew, from his research, roughly where this mystical city might lie. He managed to sneak his way into the city and was the first Westerner to do so for centuries. Once the news got out in Europe, adventurous travellers made it a priority to visit. Burckhardt is the author of many books, including “Travels in Syria and the Holy Land”, which you can read on Project Gutenberg. The elevation means that temperatures can drop sharply at night, even in summer and the sun’s rays are ever more penetrating during the hot months. 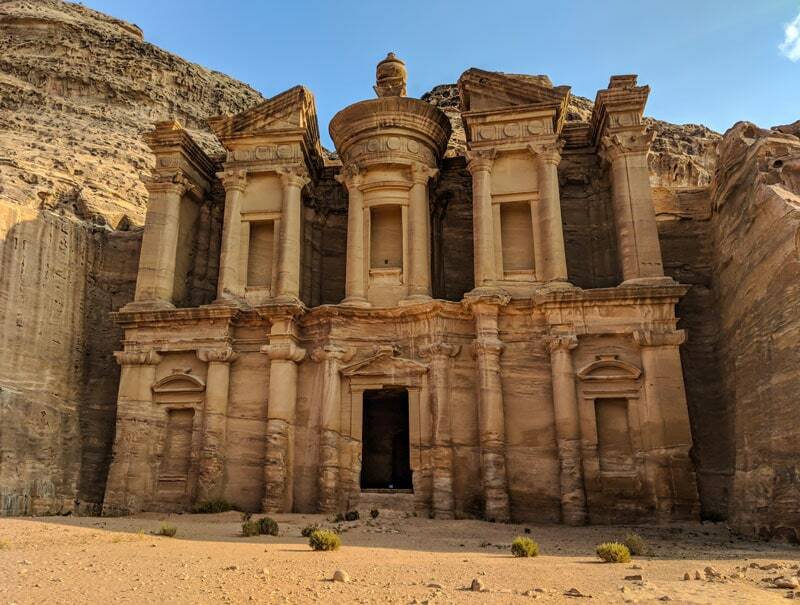 Maybe you remember the closing scenes in Indiana Jones and the Last Crusade where the Treasury (Al Khazneh) of Petra featured prominently as a backdrop? Judging by the 5000 people a month that search for “Indiana Jones Petra” on Google, it seems to me that a lot of people remember this scene. You can visit that exact spot but don’t expect it to look quite the same. The treasury is magnificent but you can expect to find tourists and touts swarming around in front of the building. Go early in the morning and you’ll avoid most of this activity. Petra is called the “Rose City” and here's a few photos to show why. The day before I was due to leave for Jordan, 5000 tourists were evacuated from Petra after heavy rains and floods in the area. But things weren't as bad as the media made out. As usual, the news media blows everything out of proportion. Bloggers frame the situation as wild and exciting. I'm sure there must be a YouTube video called “The time I almost died in Jordan”. The bedouin camp in Wadi Rum and the hotel in Aqaba assured me that everything would be fine. And it was. When asked about the dangers of flash floods in the two most important tourist areas of the country, people just clicked their tongue and shook their heads. It’s not a big thing. “No tourists were hurt”, was the gist of their answers. The city of Petra has drainage canals right through it. The water system ingeniously controls floods and preserves water for drier times. So there’s little chance of you getting swept away unless you’re standing in a canal at the wrong moment. Even in the narrow valley routes through the mountains, there are ledges and higher areas to move to if the water gets too high. Dramatic scenes of tourists being swept away are unlikely. What time does Petra open? The entrance to the Lost City opens at 6am. And if you can make it that early, all the better. 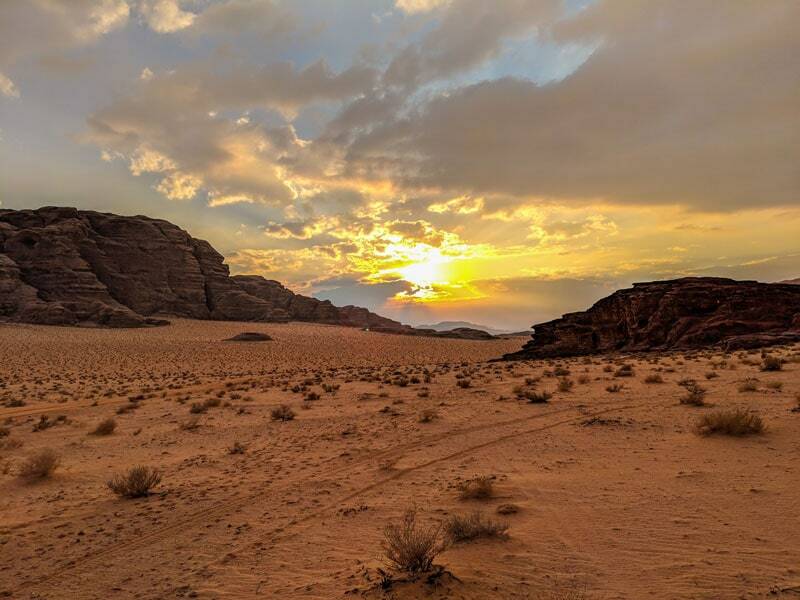 Fewer people around, cooler temperatures, and the beautiful sunrise colours of the Jordan desert makes this time of day the best time. Tip: In winter (November – February) bring a hat, gloves, and scarf for 6am departures. It’s cold at that time of day. The first 30-60 minutes of walking will be on a gently downward gradient so there’s not much chance of breaking a sweat. Unless you run. If you really want to avoid the crowds, get a horse and cart to deliver you to the Treasury for some tourist-free photos of probably the most famous icon in Jordan. One day costs 50 JD if you stay a night anywhere in Jordan. That will include most people but if you’re taking a day trip over from Israel or another country, the entrance fee rises to 90 JD (around 130 USD), which receives complaints from the kind of people that complain about these things. Two days in Petra costs an extra 5 JD on top of the one day pass. I highly recommend taking a two-day trip to the city. Three days is even better. Get the Jordan Pass! It’s worth it. Especially if you’ll be spending any more than a day or two in the country. It works out so much cheaper in the long run and saves time on queuing. The Jordan Pass makes total sense if you plan to spend 2 days at Petra. I walk fast and am reasonably fit, but I still needed a couple of days to see the highlights. You could see everything in one day if you start at 6 am and finish when the park closes, but that will be an exhausting itinerary even for the fittest if you plan to walk. Grabbing donkeys, camels, and horse and cart transport will save you a bit of time. The Petra By Night even is very popular but isn’t included on the Jordan pass ticket. It wasn’t something I was particularly interested in, so I passed on this one. I asked a lot of people if they’d done the night excursion and what they thought. The vibe was that Petra by Night is a fair-to-middling experience. When something costs money (quite a bit of money in this case) people tend to rate the experience higher. But don’t take my word for it or even the word of other travellers. Do your research, decide whether it might be something you’d enjoy, and please don’t go just for the Instagram photos. Search images.google.com for “Petra by night”. You’ll see pretty much the same photo over and over. From June to September you can expect a burning hot sun, especially at midday, when the sun’s rays come straight down between gaps in the valley walls. From November to February the days are pleasant (bring a jacket) but nights can be very cold. November is the rainiest month with October and December close behind. Summer is less crowded because of the high daytime temperatures. If you can stand the heat, the Lost City is yours to experience in relative peace. Visit at midday and only the lizards and snakes will join you. November, the month I visited, is part of the high season but I expected to see more people. The fact that I’d just been in over-touristy Rome a few days before might have changed my expectations. There was plenty of room for everyone. 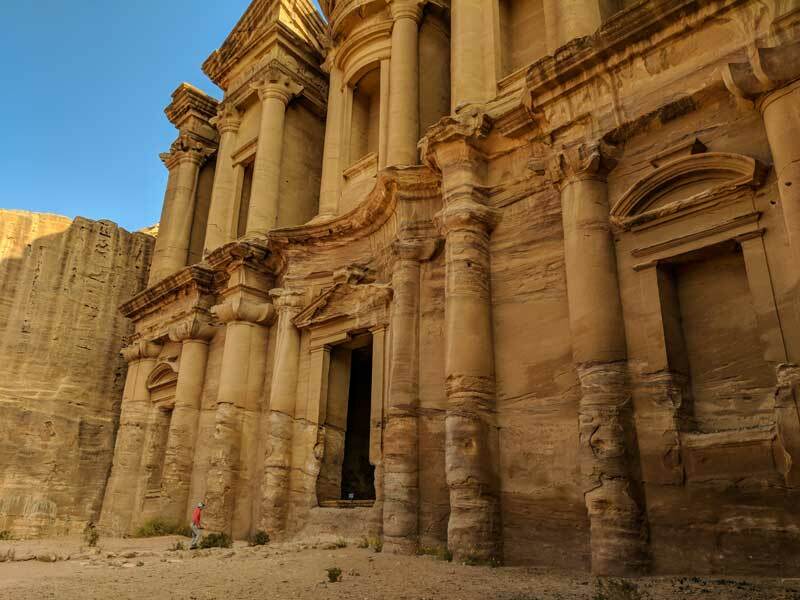 The Treasury, of course, is a must see and you can’t miss it if you enter Petra via the main gateway. The walk to the treasury. The narrow walkway (Siq) that leads to the treasury is so absurdly cinematic that it feels like Hollywood forgot part of their set. Again, I recommend going early because this spot reaches selfie stick saturation levels later in the day. The Siq is only 4m wide in some parts and it can get crowded. Around the Treasury, you’ll get plenty of offers from “local guides”, basically kids with an entrepreneurial streak who will guide you the “dangerous” walkways to a lookout a hundred feet above the Treasury itself. It’s a fantastic spot but you can visit a lookout spot only metres away from this one, for free, by walking around the back way. I asked the tourist police near the Treasury if I could walk up the easier route myself. They said no. But I wasn't convinced. Seems to me that it’s just the locals creating their own business. And I wouldn’t deny them some cash if it was reasonable. The alternative route is a lot more work, but the climb is part of the fun and there are some great views on that side too. By the way, there’s nothing inside the Treasury, apart from a flat foyer or entrance way. The facade is what people come to see. And very pretty it is too. One of my favourite parts of the city but maybe because it was early morning in November and there were few people around. The hike up turned out to be a little different than expected. Arriving at the start of the trail, a Bedouin lady called out to me and asked for help with putting bags on her donkey. That was a first for me (I’m a city guy). After bags and donkey were united, she asked me to hand her a large tabletop as she sat on the donkey. To my disbelief, she grabbed the heavy plank of wood and holding it sideways across the donkey proceeded to march up the hill. Keeping a safe pace behind the balancing act, I followed along and periodically helped her reset her carrying angle. After a few minutes of watching this super strong lady struggle, I offered to take the board. I propped the tabletop on my head and started walking. Despite, the weight on my arms, the climb wasn't hard. We soon passed two giant and fit-looking American guys who were struggling with the climb. The look on their faces as I stormed past with a chunk of wood on my head was worth all the effort. I knew CrossFit would come in handy. We reached the top soon enough, and the woman offered me some sweet mint tea (as is customary everywhere) and gave me a scarf. Scarves in this part of the world are multi-purpose tools. And I'd forgotten to bring one. This was a welcome gift. The monastery looks like something built by giants. The sheer size of the door doesn't even make sense. It's only when you see another person walk through the entrance do you realise just how big the facade of the monastery really is. I continued walking from the Monastery to what’s called the Bedouin Village. It’s a long way and not something I’d recommend. But I’m stubborn and can walk big distances. What’s strange is how there are no ticket checks, or inspectors, or signs of any sign once you pass by the monastery. In fact, you could enter Petra from this side and not pay an entrance fee. I’m not saying you should do that. Please don’t! But if anyone knows why this is so, let me know. About 5 minutes from the Monastery are some super steep jagged cliffs. For the next 20 minutes of walking, the most beautiful vistas of Jordanian valleys, gorges, mountains, flatlands, and even Israel in the distance are all around. I stayed at the Candles Hotel, which is looking a bit old, but does the trick for a couple of days. And it’s very good value. There’s a mosque right next door, so I'd recommend asking which room you’re getting. Unless you’re a heavy sleeper, the call to prayer at 5.30am from a gigantic loudspeaker 20 feet from your window is a bit of a shock to the system. On the plus side, the Candles hotel is only a few minutes walk from the gate of Petra. Very convenient, especially after a day on your feet. There’s also a good value buffet at the hotel from 6 pm in case you want to skip pizzas and kebabs. The town of Wadi Mousa is incredibly hilly. You’ll have to climb some pretty steep streets if you plan on walking around the town. Most people take taxis back to their hotels from the Petra gates. I spent a few hours at the Movenpick Resort Cafe & Bar, which by any standards, is excellent. Not cheap, mind you, but a superb spot for people watching, catching up on reading, or in my case, some admin for my work. The hotel is right across the road from the walls of the Petra complex so guests can walk out of their hotel and be on the trail in minutes. The Movenpick is a 5-star hotel but if you’re only staying one night in town, it’s worth checking the deals on Agoda to see if a bargain pops up. The hotel has a pool and a great veranda where to can take in the desert nighttime air. So how has the disneyfication of Petra affected the local people, the environment, and Jordan, in general. Petra was one of the places, along with Wadi Rum, that accelerated the tourism growth in the country. 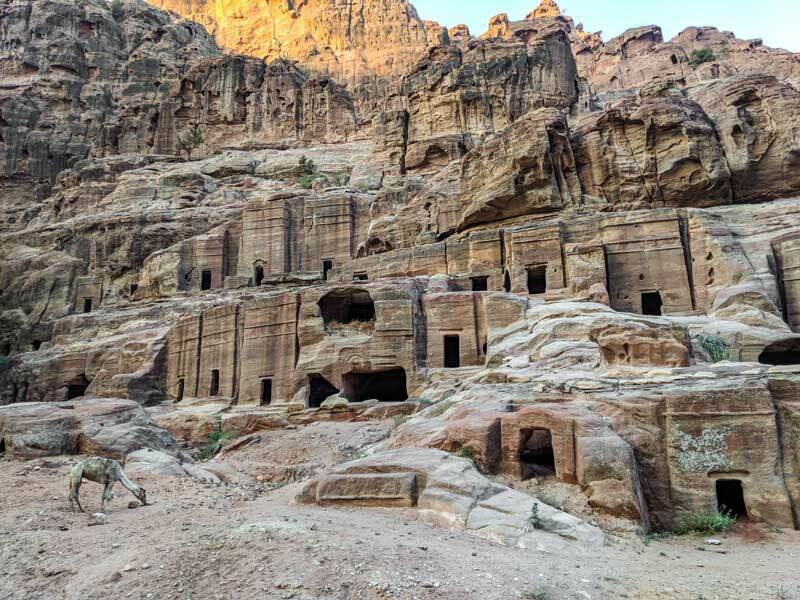 From a sociocultural stance, tourism in Petra has had a positive impact. 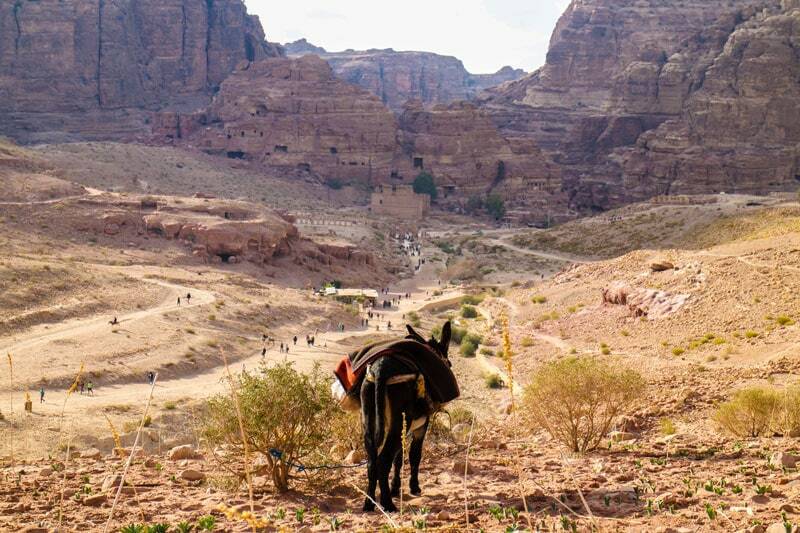 Although the way of life of the local people has changed dramatically, even for the Bedouin who remain connected to the land, living standards (health, sanitation, education) have all improved. Is that not a good thing? Some people would argue against it but Petraians are in favour of progress. It takes about 3 hours to drive from Amman and two from Aqaba. But beware, travelling by local bus can be time-consuming and frustrating. The night before I left Petra for Amman I asked my hotel desk manager where and when I’d expect to get a bus to the capital. His reply was that there was a bus at 6:30. Noted. Experience has taught me to ask three people on these matters. The second person I asked (who also worked at the hotel) told me she was from Amman and that there was only one bus a day, leaving at 4pm. The third person gave me something different again. If you're looking for it, the bus station in Petra is across from the Firas Restaurant. The “station” isn't marked o look for the restaurant. I arrived at the station at 5:30 am. The bus pulled up at 6 am. All good so far. 4 hours later we arrived in the Southern part of Amman. Another taxi ride and I was finally at my hotel. 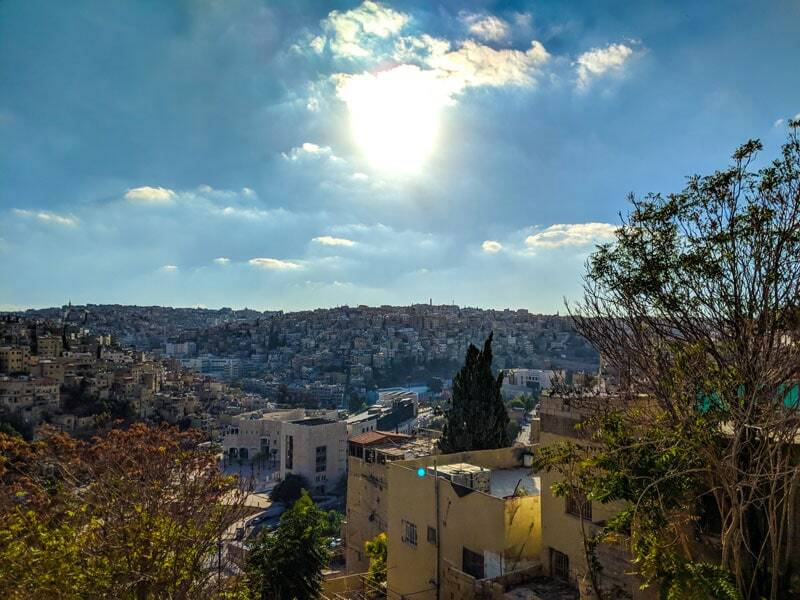 Amman, the capital of Jordan, is a city of hills and windy streets. It looks just like I'd imagined it. Off-white stone buildings with small windows, plenty of construction, and the sound of the Muslim call to prayer every few hours. This is one of the most westernized cities in the Middle East. You can find nightclubs, bars, and all the Western chains here. I’ll admit that I had high hopes for the Jordanian Capital, but the city didn’t quite live up to my expectations. Slow travel is always preferable, and this was more of a flash visit. It’s possible I didn’t give it enough time. I had planned out 3-4 days in Amman but I cut that down to just two. After a day in the city, I lost motivation to explore further. 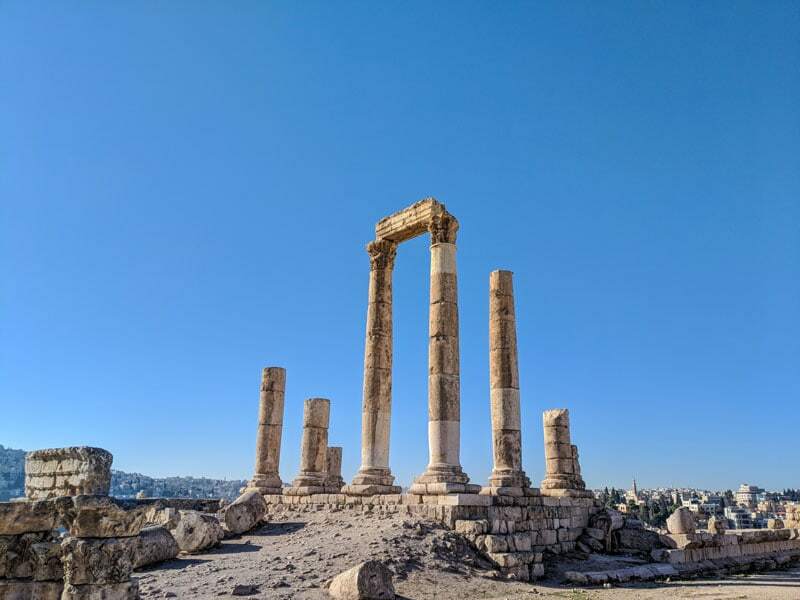 The Citadel of Amman (Jabal al-Qal'a) is well worth visiting if not just for the views over the city, which looks a lot prettier from up there. Your Jordan Pass gives you free access to the Citadel. Gates open at 8am. I just happened to arrive at that exact time. Plenty of websites mention an opening time of 9 or 10am, especially in the winter. I wanted to go for a walk anyway so took the chance. In Jordan, websites are unreliable and outdated. Asking people might not get you the right answer either. Sometimes you get lucky by just turning up, as I did. Apart from one large German tour group, I had the place to myself. And at that time of the morning, the citadel grounds and the entire city look very pretty. Food and drink in Amman are a bit cheaper than in the touristic areas of Petra, Aqaba, Wadi Rum, and the dead sea. For most people, Amman is a stepping point to somewhere else. Tourist attractions are few. People watching and absorbing the atmosphere of the place are the real attractions. Avoid the touristy food places near the amphitheatre. The quality is low and the prices are high. Hashem restaurant in the downtown area is not only a major landmark but a very popular and historic cafe. With over 6000 Google Maps reviews, this place has earned the reputation as the most popular restaurant in the city. This is a typical local Jordanian food place and has been around for years. Royal family members dine here. You might expect swanky decor. But the beauty of the restaurant is that it’s still an airy, alleyway style eatery. They serve street food, on the street. Flying in the face of modern trends. Oh, and there’s no menu. Most people know what they want. For falafel, a great choice in Jordan, check out Al-Quds (Al-Rainbow Street), apparently the oldest falafel place in Amman. It’s a hole-in-the-wall type place so don’t expect a sit-down experience. There are benches right beside the counter so if you’re lucky you can find a spot to sit and enjoy your falafel sandwich. Al-Quds is great value and perfect for the solo traveller who just wants a bite to eat on the run. And surprise: Amman residents and Jordanians drink alcohol. Not everyone, mind you, and it’s forbidden by Islamic law, but there are plenty of liquor stores around town and they’re all doing roaring trade as far as I can see. I asked the locals about it and everyone seems to be quite open about the use of alcohol. You won’t see people drinking in public and shows of public drunkenness are taboo, but people drink privately at home. [email protected] is where you’ll find the greatest concentration of Westerners during the day (apart from the touristic sights). The interior reminds me of some kind of New Zealand beach town cafe for some reason. There’s a balcony, with plenty of space and bit of a view. Nobody was using it in November. The coffee is good and the service is excellent. And best of all, the downstairs area is filled with one of my favourite items, books. There’s no real reason to stock up on paperbacks though. Prices are higher than in Europe or the US, for example. But if you’re in desperate need of a good read, this is the place to go. There are also many local books (and guidebooks) for the curious-minded. Caffé Strada is the best cafe in the city. This is a modern, clean, and airy cafe serving tasty coffee and Western-style snacks. Opening at 7 am, Strada is one of the first places you can get your caffeine hit. And the coffee is delicious, prepared by a professional barista. You'll find Caffé Strada close to the first circle and not more than a 25-minute walk to the citadel. The place is huge so there’s plenty of choices of seating. You can visit and walk in the prayer area outside the prayer times. The interior reminds me of the blue mosque in Istanbul, but on a slightly smaller scale. I'm not not religious, mosques (more than churches) give me a small sense of peace. I’m not sure why this is but it most likely has to do with the sense of calm and purpose. People are focused and serious in mosques. Right across the street it an orthodox Christian church. The two places of worship of the two largest religions are almost within arm’s reach of each other. The photo below shows just how close. I enjoyed the fact that peaceful coexistence of religions happens almost everywhere in the world. The news and a tiny percentage of radicals in certain areas create tensions and a warped sense of what’s actually happening. The truth is that most people of religion respect other beliefs. The amphitheatre is interesting more for the fact that it’s saturated right in the centre of the city. If you fancy a bit of exercise, hike up to the top row of seats. It will make you appreciate how fit and flexible people must have been back when the amphitheatre was constructed. It’s hard work climbing to the top, even for fit people. Amman directions often include the location of the “circles” around the city. These are roundabouts for traffic. A taxi driver might ask which circle your hotel is near? First circle, the second circle, etc. Use them as landmarks to find your way. The most interesting parts of the city for the casual day-tripper are found near the first circle. I don’t want to get into gender identification issues so let’s keep it simple here: If you’re a guy, sit in the front, beside the driver. Women should sit in the back seat. Uber is illegal so if you grab an Uber and have to pass through a checkpoint like the one at the airport, the drive will ask you to sit in the front. On my last day in Amman, I asked a couple of people for the taxi rates to the airport. (There’s a bus, but it’s slow and you need to get to the south of the city – by taxi – to take it. In the end, a taxi is the only real way unless you’ve got all day). $25-35 seemed to be the going rate. Expensive. So I fired up Uber on my phone and checked the going rate there. $17 was the quoted price. I’ll admit that’s not a huge saving, and I’m not a big fan of Uber, but I’d had enough of regular Jordanian taxi drivers. And I was curious to see how drivers working for rideshare companies were faring in the country. I took the Uber and less than ten minutes later the driver was outside. Whenever I jump in a taxi I like to ask a few random questions to find out what kind of driver I’m going to be riding along with. Over-sharing, boring taxi drivers can really put a downer on your day, but I’ve met some interesting characters on my travels. The taxi driver and I got talking on the ride to the airport. I found out that the driver was a successful textiles importer in Jordan. In fact, it sounded like he had a bit of an empire. He’d travelled to Iraq, Mongolia, China, all over Europe, the US, Kenya, and plenty of other places that most people can only dream of. Why was he driving a cab? Because he likes driving and because Jordan is expensive. His business can manage itself without him being at the helm 24/7 so he uses his spare time to drive and earn a bit more. Where was his favourite place in the world? Iraq, before the war. I was so interested in hearing his story that when he dropped me off at Queen Alia International airport, I left my camera in the cab. And I realised that I hadn’t backed up any photos at that stage. One of the best features of Uber is the ability to track your driver and also communicate directly with them. I called my textile magnate driver and he promptly returned with the camera. A small crisis avoided. I asked the driver (let’s called him Ahmed – it might have been that) what he felt about Israel and Israelis. His reply was that the people of this neighbouring country were his brothers. He felt only love for them and they were the same. Of course, he knows there were some bad eggs in the basket and that the news only focussed on the bad stuff, but he liked the people and he welcomed them to his country. I liked hearing this. Made me realise once again that people everywhere are just trying to get on with their lives and get along with their neighbours. It’s the radicals, politicians, and people with hidden agendas that cause all the problems. They’re in the minority but they have the loudest voices. Aqaba is the only major town on the southern coast of Jordan, at the southernmost part of the country. The Jordanian coastline is quite short and you can even see Israel, Egypt and Saudi Arabia from the port. Eilat is just across the border with Israel. The beaches are nothing to write home about but the snorkelling and diving are world class. Many years ago, I spent a few weeks snorkelling on the other side of this narrow red sea channel along the coast of Egypt, near Dahab. It’s one of the best places in the world to see sea life, coral, and wrecks up close. There’s also a thriving watersports industry in Aqaba and the rest of this part of the Red Sea. The water close to the beach here smells mildly of gasoline so it’s not the ideal place for splashing about. Unfortunately, water pollution is an issue and a lot of the damage to the coral (one of the most diverse reefs on earth) and marine life is from the trash left on beaches and thrown off boats by local and international tourists. The Aqaba Castle (Aqaba Fortress) is underwhelming .The history of the place is the most exciting part, but it's something you can read about without stepping foot in the place. In early 2019, quite a bit of it is still under restoration, which makes it even less appealing. The castle entry fee (although inexpensive) is included in the Jordan Pass ticket price. The 12th-century building was originally a Crusader fortress and the original construction was destroyed by the Sultan of Egypt and Syria, and rebuilt in the 16th century. To the west of the large roundabout on Al-Husein Bin Ali Street you’ll find a concentration of pubs, restaurants, and to the South, you’ll find a few shopping malls. I found the food choices in this town better than anywhere else in Jordan. This might be partly thanks to the volume of tourists that pass through. 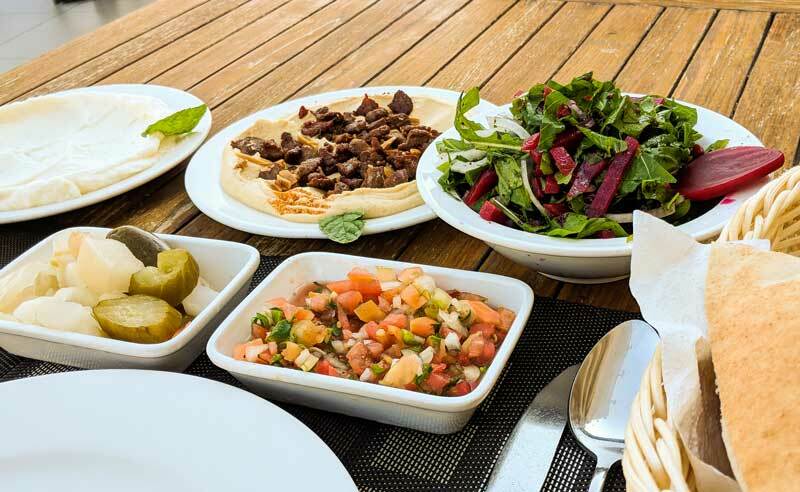 There are some typical Southern Jordan dishes that you should try. The Rakwet Kanaan Restaurant (open from 7 am to 2 am) isn’t the cheapest, but it serves delicious fish and side dishes. And the portions are large. 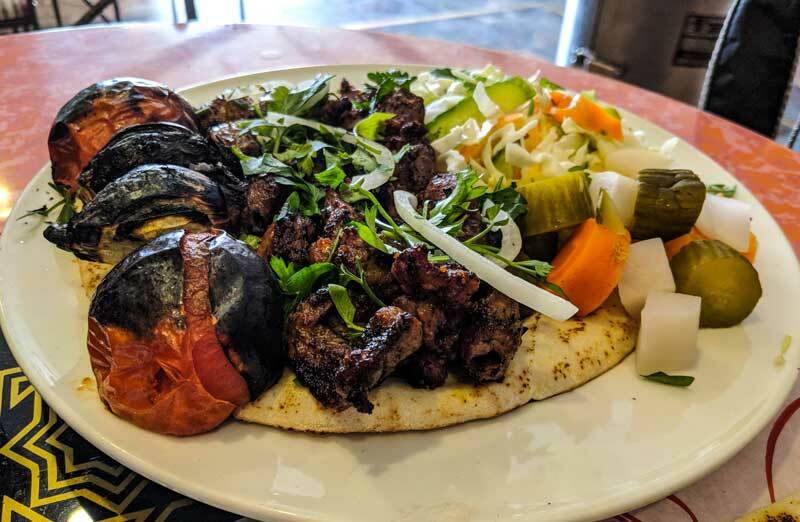 Jordanian food is the focus and you can find some traditional local dishes here that are absent from many of the international food-focused places nearby. The outdoor seating is great for warm evenings, despite the lack of any real view. This is also a cosy spot for a couple’s dinner. Alibaba Restaurant, one of the better-known eating places in town, was recommended as much as it was rejected by the locals I asked. I didn’t try it but it’s very popular so might be worth a snack to test the waters. The night before I left for Petra I asked the hotel manager and a couple of other random people about getting to Petra. I also checked the guidebooks online and the usual places. Turns out that Jordan isn’t a great place for easy independent travel. But who said travel should be easy, right? Nobody could accurately tell me when the bus to Petra (one of the main tourist attractions in the country and a draw for almost 100,000 people a month) would leave. “How can there not be a bus schedule?”, I asked. Turns out that most people arrange everything beforehand. The locals use buses, of course, but they tend to leave when the bus fills up and it appears to be an insider secret where they leave from and when. I woke early and wandered down to the bus station (more a car park with no discerning features – at least not of the “bus station” type. With no transport in sight, I asked the locals their thoughts on the next bus to Petra. The hysterical laughter and stream of Arabic from the group made it clear I wouldn't get any useful information that day. Just then, a tiny old man approached and, in good English, asked if I was going to Petra. I’m naturally cautious and suspicious of strangers approaching me offering guidance or help. So I said yes but made it clear I wasn’t interested in paying for an expensive taxi. The man explained that the bus wouldn’t arrive for a couple of hours (might have been true) and that had to leave for Petra to pick up a client. He was scheduled to arrive in a few hours but he could take me early (for him) if I wanted. His price was half the going rate. So I accepted his offer. I was glad I took the cab, not only because it was faster and cheap, but because the cab driver was a good travel companion. We talked about living in Jordan, Islam, alcohol, Saudi Arabia, money, international relations with Jordan’s neighbours and random pub talk. He was happy to discuss and I learned a lot. I noticed that there were a lot of liquor stores in Aqaba (later I’d see even more frequent liquor stores in Amman) and I asked the driver if Jordanians drank a lot. He was coy with the answer, almost as if he didn’t quite want to admit it but said that “yes, some Jordanians do drink”. When I wondered out loud how Jordan’s neighbours in Saudi Arabia (less than 30km away) felt about this. Saudis live under a much stricter regime. He took a long breath and told me that they come across the border in their thousands to drink. They also stock up on booze for the trip home (Aqaba is a duty-free zone) and hence the checkpoints on all roads out of the city. The taxi man had spent years driving trucks all over the middle east. He enjoyed it but his children convinced him to quit after the gulf war and the current problems in Syria started. It was too dangerous, he said. Which part of the middle east did he like best? Again, the answer was Iraq. Before the war, of course. In my lifetime, I’ll likely never see the true glory of Iraq, the modern name of Mesopotamian Babylon, where writing, astronomy, and mathematics were developed. Friends tell me that the country is still well worth visiting, and it’s on my list. Both Wadi Rum and Petra are unforgettable and should not be missed. Stay overnight in both places for the best experience. Buy the Jordan Pass! Bring walking boots and do some hiking. Don't forget your camera. Enjoy!